It's a story about a girl and her journey through the last year of high school. Quinn is just trying to get her life back to normal, after an incident that she's trying her best to forget. 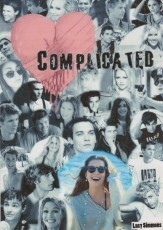 Complicated pulls on all the heart strings, as the readers are thrown into Quinn Gilmore's 'complicated' life. There's love, there's violence, there's all things in between.